We recently went through the process of getting an Individualized Education Program (IEP) for one of our sons. Before becoming a stay-at-home mom I was a teacher, so I had been in IEP meetings before, but having this experience as a parent was new to me and it gave me a new perspective. While everyone’s experience may be different, I want to share some tips that might be helpful for other parents as they work their way through the process. First, let me say that everyone we have worked with has been wonderful. They have been helpful, polite, and kind. Even so, this process has been hard emotionally. The emotions really hit me during the Evaluation Team Report meeting. This happens once everyone on your child’s team has completed their evaluations; you have a meeting to review the results of those evaluations and determine if your child is eligible to receive services. Each team member will share the results of their time spent evaluating your child, and in doing so they will list a whole bunch of things your child can’t do — things that they should be able to do. This is the part that I found difficult. It made me sad, it made me worried for the future, and it made me feel guilty. I felt as though every deficiency of my child was my own, in a way. Now, I will say that everyone on my son’s team also said some very nice things about him, spoke about his strengths, and gave a very positive prognosis for the future. I know it’s totally a necessary part of the process to go through everything, but it was still hard for me and it might be for you, too. If you look hard enough, every kid has some things that they need to work on. Yes, some are harder than others, but your kid is not the only one. They will share a long list of things your kid can’t do, but remember, there are so many things he or she can do. Your child is not defined by the things he or she cannot do. You’re an amazing parent who is working to get your kid the help he or she needs. 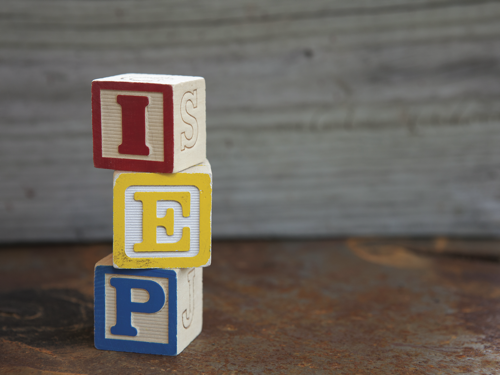 Here are a few practical tips to help you make the most of the IEP process. These meetings are long and sometimes there are some technical terms thrown around that are unfamiliar to most people. Don’t feel intimidated or afraid to ask questions. Read through it and highlight anything that you don’t understand from the evaluation or things you want to talk about in particular. Jot down your questions. You’re going to be bombarded with information, and having some notes to refer to will help. All your IEP forms will have emails for your child’s teachers and other professionals. Use them. Before, during and after the process, reach out when you have a question, concern, or just want an update on your child’s progress. Ask for occasional updates on your child’s progress. At the end of the school year, I scheduled a quick meeting with my son’s teacher so that I could hear a little more information about how he was doing and get some ideas of what we could do to best help him keep moving forward in the summer. I know it wasn’t conference time and that time is precious for teachers, but I know as a former teacher myself that these quick face-to-face meetings can be extremely helpful. Cat Webel is a former teacher turned stay-at-home mom to two boys. A self-described “jack of all trades, master of none,” she enjoys traveling, sewing, cooking and blogging at marymarthamama.com.